SANTA CRUZ, Bolivia — "Against narco-communism," reads one line of graffiti in this city in the lowlands of Bolivia. "To arms, Cruceños," reads another, calling on residents to fight the government of President Evo Morales, who put the armed forces on alert this week as four eastern provinces move toward greater autonomy. Elsewhere in South America, such calls might be dismissed as mere bombast. 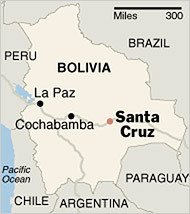 But not in Bolivia, where fears of political violence are intensifying in Santa Cruz, a bastion of opposition to Mr. Morales, a former coca grower and the nation’s first indigenous president. Those tensions may reach a crest on Saturday. That is when leaders of Santa Cruz province and three other provinces — Tarija, Beni and Pando — are expected to declare their autonomy before tens of thousands of antigovernment protesters. Santa Cruz’s assembly has already taken a step in that direction, passing a resolution on Thursday giving the province a bigger share of tax and petroleum revenues and allowing it to constitute its own police forces and create its own television network. "They call us reactionaries, but we have a lot to react against," said Wilson Salas Pinto, 43, a director of the Bolivian Socialist Falange, a right-wing group here whose members wear black berets and parade with their hands in the air à la Mussolini. "Evo wants to transplant Cuban Communism to Bolivia. We’re prepared to resist that project." Upon first glance at the ethnic tensions here, it is easy to focus on increasingly vocal fringe groups like the Falange. A counterpart on the left is the Ponchos Rojos, or Red Ponchos, indigenous activists from the high plains who recently slit the throats of two dogs before television cameras as a warning to those who resist Mr. Morales’s plans. Eastern Bolivia’s clash with the president, however, is far more complex. Leaders here have long chafed at the influence of the capital, La Paz, but recent moves by Mr. Morales, who has received substantial financial and political support from President Hugo Chávez of Venezuela, have added to concerns over power consolidation. The sudden moves this week to seek greater autonomy came after the president’s supporters rushed last weekend to approve a new Constitution, despite an opposition boycott of their assembly. They had abruptly switched the vote to the city of Oruro, a Morales stronghold, from Sucre, which had been racked by street protests. Even Mr. Morales’s critics acknowledge that the new charter, which must be approved in a public referendum, has positive aspects — it would, for example, abolish child labor. But they are also alarmed by efforts to increase indigenous power, like items to guarantee representation of Indians in Congress or to allow Indians to mete out justice outside the judicial system. Another measure would allow Mr. Morales to run for re-election to a second five-year term. The way the constitutional changes were approved did little to burnish the president’s democratic credentials. "Evo, in trying to empower the indigenous, has made the same mistake Chávez did in trying to empower the poor," said Jim Shultz, a political analyst in Cochabamba. "Evo also erred in trying to mix that agenda with trying to empower his political movement." Political power is one issue dividing the country. Petroleum is another. Most of the natural gas and oil in Bolivia, which has South America’s second-largest natural gas reserves after Venezuela, is produced in the east. But Mr. Morales recently moved to use some petroleum royalties to finance new cash payments to the elderly, an attempt to forge a social security system for his nation, one of Latin America’s poorest. This plan would deprive provinces in the east of revenue used for works like bridges, roads and schools. Much of the power over petroleum remains in the president's hands, and left-leaning leaders in Argentina and Brazil, the main buyers of Bolivian gas, are not about to make deals with Santa Cruz. This leaves the province in need of something other than independence. The cultured elite of La Paz mock Cruceños as newly rich and materialistic. But wander into a bookstore here, and shelves are filled with titles revealing what makes Santa Cruz different, from its history — linked to the colonial powers in Asunción, Paraguay, instead of Lima, Peru — to its current gaze eastward to Brazil for cultural and economic inspiration. Anger over Mr. Morales’s policies is reflected in the plaza here, where some 700 people have been on a hunger strike for a week. They sleep under tents in hammocks, sipping orange juice and watching the news on flickering televisions hooked up to generators. Many are light-skinned 20-somethings of the moneyed classes. Racism, supporters of the president say, is behind much of Santa Cruz’s pride. Indeed, other graffiti in this city refer to Mr. Morales in profanely racist terms. But here, too, Bolivia’s overwhelming diversity belies some of that argument. 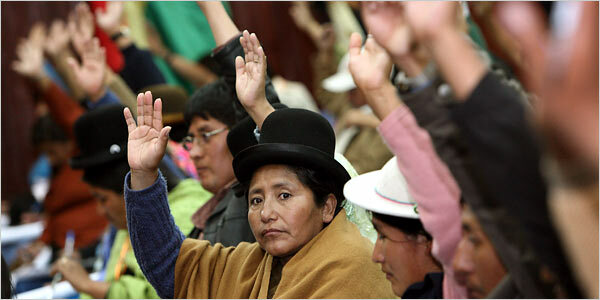 Other hunger strikers in the plaza are members of indigenous groups who are unhappy with Mr. Morales, an Aymara Indian who was born in a remote village of the altiplano, or high plains, before cutting his teeth as a leader of coca growers, largely Quechua-speakers, in the tropical Chaparé region. "Evo wants a totalitarian Aymara regime," said Amalio Siyé Ramos, 51, a leader of the Chiquitano ethnic group. “The Chiquitano, Guarayo, Guaraní,” he continued, naming ethnicities in Santa Cruz, "mean little to him." Is Balkanization looming in Bolivia, where a small elite has lorded over Indians for centuries? Political analysts think not. "We could see street fighting by small radical groups on both sides,” said José Mirtenbaum, a sociologist at Gabriel René Moreno University here. "But full-fledged civil war is not something we’ll see." Pro-autonomy leaders here say their goal is not political independence. Instead, they say they are drawing inspiration from Spain, where regions like Catalonia have been granted more administrative powers. "The Quebec model is even too extreme for us," said Juan Carlos Urenda, a lawyer who helped draft the autonomy statute. All this would be simple enough if the complexity of Santa Cruz itself did not intrude on such ideas. Mr. Morales, after all, captured some 30 percent of the vote here in elections in 2005. Many of those voters remain loyal. "The elite would prefer us to be in reservations or on wall paintings, as in the United States," said Silvestre Saisari, an indigenous land activist here. "We are not about to let that happen."